Yesterday’s post offered advice for dealing with “vegetable exhaustion:” Take a break every now and then by using frozen vegetables, which require little to no prep time. Here’s a great, “take-a-break” one dish meal, made easy with not only frozen peas, but also a convenient frozen fish fillet. Place peas in medium-sized saute pan with a lid. 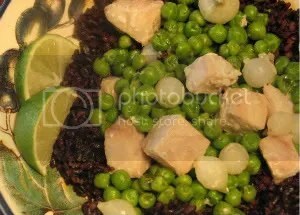 Turn heat to medium, cover and cook about 5-8 minutes, stirring occasionally, until peas and onions are thoroughly cooked and moisture has evaporated. While peas cook, combine half of lime juice and all of soy sauce in a soup bowl. Gently squeeze fish cubes to eliminate excess moisture, then place in lime juice mixture and toss to coat. Reserve. Once peas are done, reduce heat to medium low and push to sides of pan. Into center of pan, pour oil and allow to warm for 10-15 seconds. Stir ginger into oil and cook about 30-45 seconds. Dump reserved fish over ginger and spread into a single layer. Cook a minute or two to lightly brown one side, then pour in broth and coconut milk. DEGLAZE pan, then reduce heat to low, cover and allow fish to cook another minute or two, stirring a couple times, just until fish is cooked through. Avoid overcooking fish. Immediately remove pan from heat. 2 cups cooked Forbidden Rice, brown basmati or other whole grain brown rice or quinoa. Sprinkle with fish sauce and remaining lime juice, to taste, then serve stew nestled into a bed of rice that has been warmed in microwave. Snap or Snow Pea Option: Try substituting fresh snap or snow peas for the frozen peas, when in season. Slice them about ¾ to 1” thick and SIMMER-STEAM in about ½ cup broth, just until crisp-tender and still bright green. Fish Options: Cod, snapper and talapia make good substitutes if Mahi Mahi is not available. Brands: Columbia River peas are called for because they are so sweet and flavorful. Another brand can be substituted, however.